EL SEGUNDO, Calif. -- The question has been directed at Jonathan Quick so often lately he might as well wear his blocker during interviews to better deflect it. No, he did not get worn down last season. He felt fine despite logging 72 games, a high number for a West Coast goalie who does more travel than many of his peers. Yet even his coach, Terry Murray, acknowledged that he rode Quick too hard last season, and the evidence seemed clear when Quick finished the regular season on a 0-3-3 slide. But Quick seems to be the only one who didn't get tired just looking at those statistics. "I thought at the time last year I felt good going into the playoffs. I felt fine," Quick said, before he added that, "I do notice I do feel a little bit better." That last statement is music to the ears of the Los Angeles Kings, who are counting on a refreshed Quick for this season's Stanley Cup playoff run. Quick finished with 61 games played, one more than the number pegged by Murray at the start of the season in an attempt to preserve his young goaltender for the spring. Last season Quick played Game No. 60 on March 14 as the Kings leaned on him heavily, with backup Jonathan Bernier not quite ready for more NHL responsibility. 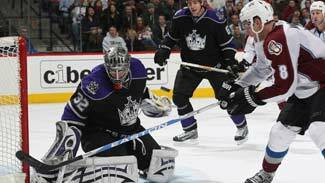 But Bernier, the top goalie in the AHL last season, has pushed Quick and taken some starts from his load. "Last year [Quick] played pretty much every single game it seems like," defenseman Drew Doughty said. "This year he's playing a lot better now, and that could be because they gave Bernier a lot more games than last year. Maybe it gave him little time to rest, a little time to sit back and relax." Doughty and teammates don't think that Quick was affected by his big workload last season, but Kings goalie coach Bill Ranford admitted that they did not get Quick the ideal number of maintenance days because of the Olympics-condensed schedule. Quick, in fact, backed up Ryan Miller and Tim Thomas on the U.S. Olympic team last February. He did not play in the tournament but practiced regularly with the team. That is a two-week period he would have otherwise used to rest and prepare for the second half of the season. "The biggest thing he talked about was how much the Olympics hurt him," Ranford said. "It probably did more harm than good." In the offseason Ranford worked with Quick on rebound control and tracking pucks behind the net, but he really hasn't had to tinker much with Quick's game. Ranford first saw Quick as a college goalie for the University of Massachusetts and remembers that he "really didn't have much of a technical package, just raw ability." That gradually changed, but Quick remains more of an athletic goalie with a knack for big games and high-pressure situations. This season, Quick won three of four games against Detroit, split a series against Vancouver and won three of five against San Jose. He is a remarkable 9-0 in shootouts. "That's a challenge that he takes on and performed very well with those kinds of expectations on him," Murray said. "You go back last year through the playoffs, I thought he was spectacular in that six-game series that we played, especially a couple of those games in Vancouver. He's a very capable goalie." The spotlight was particularly bright on Quick last season when he emerged as the answer to the franchise's perpetual question mark in net. Aside from Rogie Vachon in the 1970s, the club's list of successful playoff goaltenders is short. Ranford said that's the natural progression for Quick. "Once you prove yourself as an NHL goalie, the next step is to prove you can win in the playoffs," he said. Quick, 25, has a steady demeanor that suggests he is ready to accept whatever comes with the franchise-goalie role. There might be added pressure on him this time around considering the Kings have lost top-two scorers, Anze Kopitar and Justin Williams, to injury recently. As a result, the Kings will place more emphasis on a defensive style of play and strong goaltending in hopes of extending their playoff run. But, of course, Quick said he doesn't feel that pressure. "Not at all," he said. "It's how we played all year when they were in the lineup. We're a strong defensive team. We're solid defensively and we create turnovers and make things off of that." That's not to say Quick won't play a major role in the Kings' playoff success. "He's definitely going to be the guy that is going to be one of the biggest reasons, if not the biggest reason, for us winning games," defenseman Jack Johnson said. "It's an emotional roller coaster. It can take a lot out of you. But I think he's done a good job of mentally staying focused and even-keeled." Serious might also be a word used by many to describe Quick, but his teammates say he's looser than he appears. Heck, if the Kings get past the first round for the first time since 2001, Quick might even flash a smile. Despite the serious demeanor, he's already enjoying the ride. "It's a fun time of the year," Quick said. "It's extremely exciting to go out there and play. Every rink we go to right now is going to be sold out -- great energy. It's a lot of fun to play at this time of the year. It's what we worked hard for all summer, all year, and this is where we want to be."